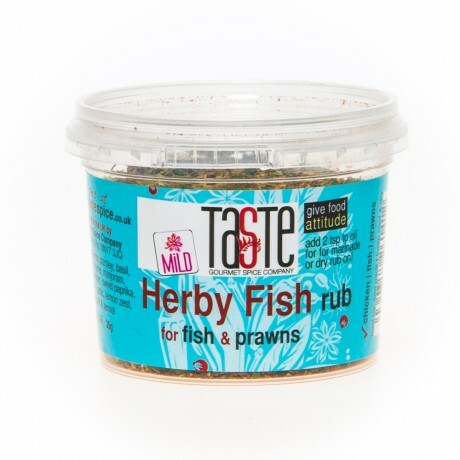 Our gorgeous Herby Fish Rub is herby, citrusy & zingy - perfect for those summer fish dishes! Lots of fragrant herbs & some lemony sumac keep this rub light & perfect for adding a huge boost to fish without overtaking it. Like most of our other rubs, this has NO SUGAR either! It makes a perfect marinade or drizzle: mix 1-2 teaspoons with a splash of oil & drizzle over fish so it can absorb all those lovely flavours. It's not just for fish either - chicken, pork, prawns, roasted veg & soups will get a huge flavour boost with no effort! Throw a pinch on feta cheese & drizzle with our Sicilian Lemon oil or add a pinch to a tomato salad - this is so versatile you'll end up using it for anything!